I’m not a big advocate on scruffing cats and during my cat behaviour consultations I often hear clients tell me that, as a way to get their cats to obey them when they have been ‘naughty’, they scruff them ‘ because that’s what their mummies would have done when they were kittens”. Breaking the myth on cat scruffing can start now! These are some of the facts below to highlight why scruffing is never a good idea in most circumstances. A kitten’s relationship with its mother is based on a different set of principles. A mother cat knows the precise pressure to place on the skin at the back of the neck. She scruffs her kittens not to reprimand them (as many people over quote) but to carry them or move them from danger. For an adult cat the action of a human scruffing it is frightening and puts the cat into an un-relaxed and guarded state. Lifting a cat or suspending its body weight by its scruff (the skin on the back of its neck) is unnecessary and could be potentially painful. It’s certainly not the most respectful or appropriate way to pick up or handle your cat. The theory was that since kittens go limp when their mothers carry them by the scruff, a tight grip on the loose skin over a cat’s shoulders would trigger the same response. But this “flexor reflex” occurs only in very young kittens. 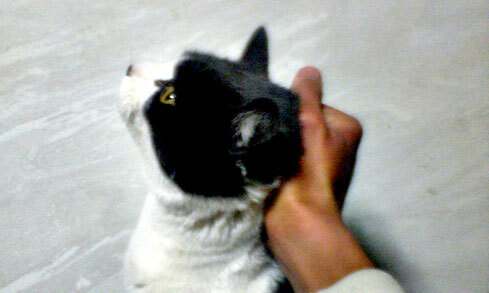 It is now thought that gripping the skin in “mother cat fashion” causes stress and can make a cat more fearful. Scruffing should only ever be used in a situation whereby you need to restrain a cat quickly because of adverse circumstances. Apart from this scruffing should never be used as a training action or reprimand. Treat your cat with respect and train in a proper manner. Forceful actions such as scruffing should never be anyone’s choice of action.